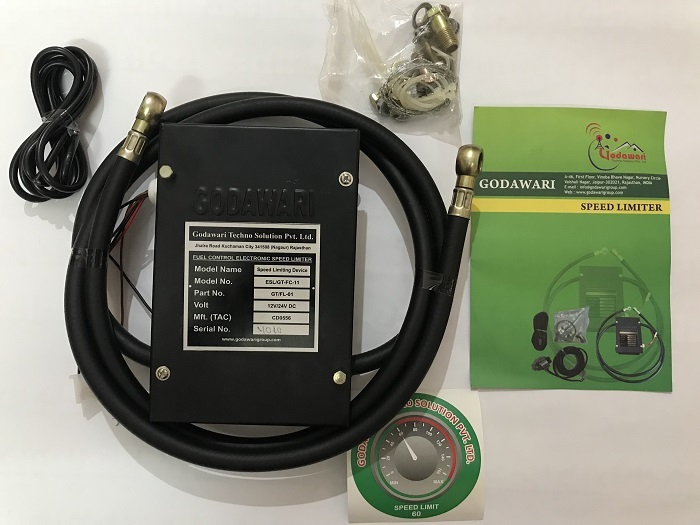 Godawari Speed Governor is ideal for fleets, where the cost of the device could be recovered within a month. This is made possible due to its smooth functioning that increases the engine life and fuel efficiency. ECU is a microprocessor based controlling device, which constantly monitors the vehicle speed and sends signals to the Control Unit accordingly. FCU is a solenoid valve mechanism which will operate according to the pulses or inputs from the ECU. Speed sensor is a square wave pulse generating equipment fitted to the gearbox output. The speed sensor is connected to the gearbox and it will detect the speed and send inputs to the Electronic Control Unit (ECU). The ECU constantly compares this speed signal to the set speed range. The Fuel Control Unit (FCU) is connected between the fuel filter and fuel pump. The FCU is controlled by the ECU which monitors fuel usage. Based on the inputs, the ECU closes the solenoid valve thereby reducing the fuel to the engine and hence the speed. This ensures that engine is not starved at all times. Even when the solenoid is closed, a certain amount of fuel flows to the engine through the bypass valve. By doing this, the fuel consumption and the speed of the vehicle can be controlled.